Imagine a classroom filled with tables and chairs. On one side of the room is an interior door, and on the other side of the room is a door leading to the outside. If you enter the dark room using the interior door late at night and you attempt to walk across that room to the outside door, the journey could be very hazardous. On that journey, you will likely run into tables and chairs. You may stumble, and you may get hurt. And you may get so frustrated and discouraged that you quit the journey altogether. But what could you do to make that journey remarkably different? Turn on the lights! Once you turn on the lights, the obstacles do not magically disappear. The tables and chairs are still there. The distance of the journey is still the same. But with the light, you can see the possible obstacles and decide how to navigate safely and effectively to reach your destination. Once the lights are on, you may see ten different paths to make your way across the room to the outside door. The college-bound journey for you and your child may be very similar. The interior door represents where you and your child are now. The other door leading to the outside represents entry to your child's college of choice. The journey from "point A" to "point B" may be filled with several obstacles. And if you attempt to make that journey in the pitch dark, without sufficient guidance or experience lighting the way, you might get frustrated and even incur a few bumps and bruises. But worst of all, you and your child might get so discouraged that you give up on the college-bound journey altogether. 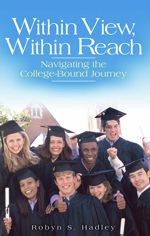 The purpose of this book is to be a source of information and insight to guide you and your child on the college-bound journey. In the following chapters, I will shed light on potential obstacles and help you see the right path toward the best college choice for your child. Each chapter will focus on a particular area where common obstacles in the college-going process are found from getting your child to simply talk about college to getting him ready and on campus for the first day of class. As new light is shed, you may discover that what seemed a good choice for your child is not necessarily the best choice, or what seemed a slim chance is a real possibility. This book may not give you all the right answers, but I do hope it will help you know the right questions you need to ask. The college-going process can be overwhelming for any family but especially if you have never made this journey before. My goal is to help you gather the information and resources you need to determine the best steps and options for you and your child to consider and ultimately execute. These are the three critical steps on the college-bound journey. Together, with this book as your guide, I hope you and your child will be able to SEE or CONCEIVE the college of your dreams, BELIEVE it is in your grasp, and ACHIEVE what it takes to get there. Within view, within reach. Let's turn the light on and get going!